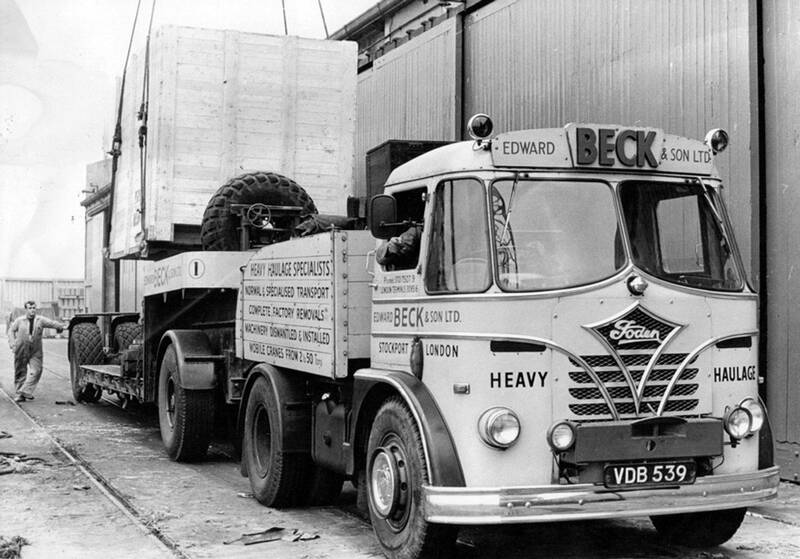 Liverpool Docks was a regular delivery and collection point for Edward Beck's. Over the years they delivered a vast amount of equipment for export on behalf of many companies including the Oil Well Engineering Company, locomotives from the Vulcan Works and English Electric generators. Also Liverpool Docks, like Salford Docks, was a regular collection point for imported Caterpillar and International manufactured heavy plant equipment. 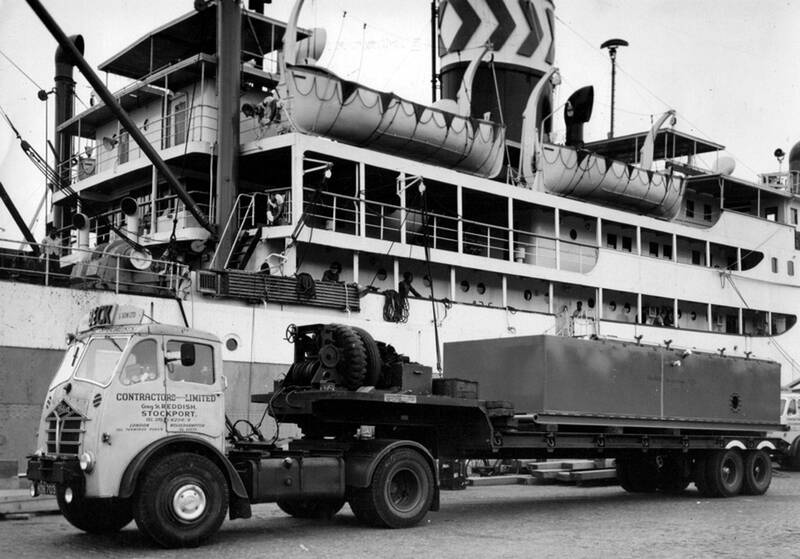 Scammell 4x2 tractor unit Reg No GLD 659 is seen here in 1959 on the quayside at Liverpool docks. 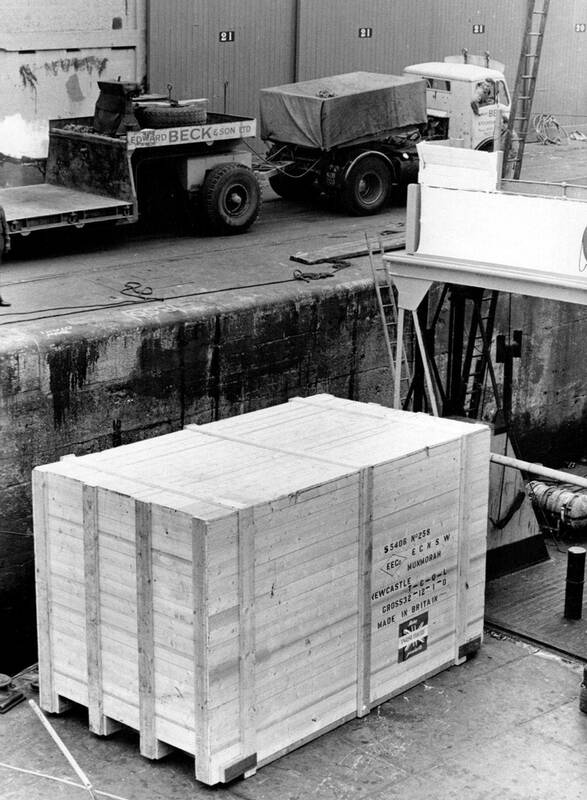 It is delivering a piece of equipment on behalf of the Oil Well Engineering Company for export to the Persian Gulf. 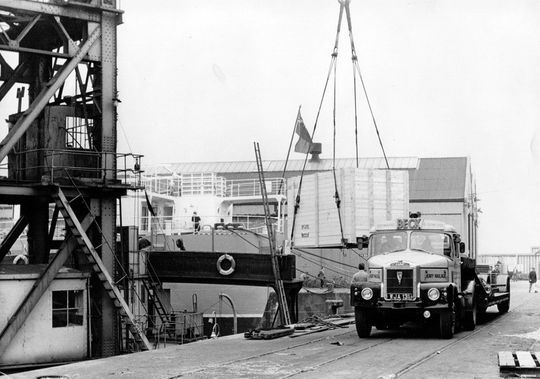 Scammell 4x2 tractor unit Reg No WJA 131 is pictured here unloading at the quayside on Liverpool Docks. 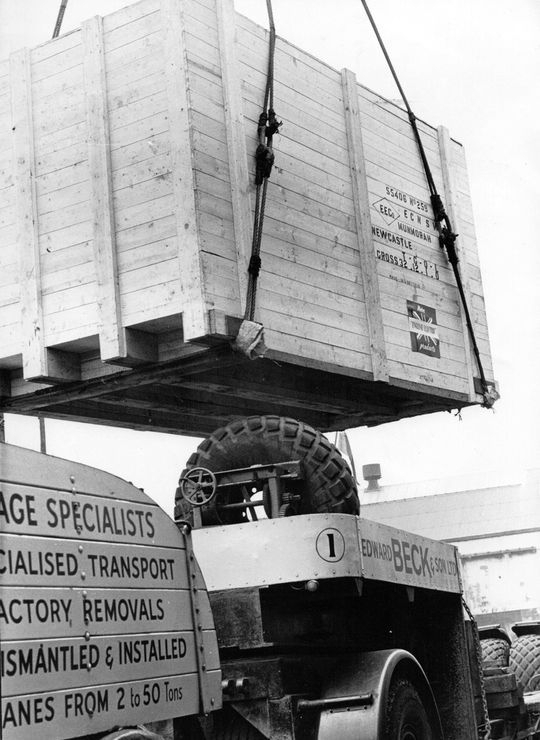 The large wooden packing case contained an English Electric 350 MW steam driven turbo-alternator destined for the Munmorah Power Station in Doyalson on the shores of Lake Munmorah New South Wales Australia. Another quayside shot taken on Liverpool Docks showing Scammell 4x2 tractor unit Reg No WJA 131 during the unloading of an English Electric 350 MW steam driven turbo-alternator destined for the Munmorah Power Station in New South Wales Australia. Foden S20 4x2 heavy duty ballast tractor Reg No VDB 539, driven by Stan Ardern, is seen here during the unloading of an English Electric 350 MW steam driven turbo-alternator destined for the Munmorah Power Station in New South Wales Australia which was constructed during the early 1960's. 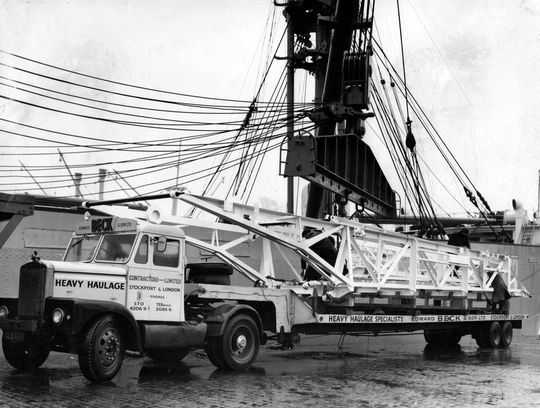 Weighing in at 32 tons this English Electric 350 MW steam driven turbo-alternator destined for the Munmorah Power Station in New South Wales Australia is seen here being lifted onto the ship at Liverpool Docks. 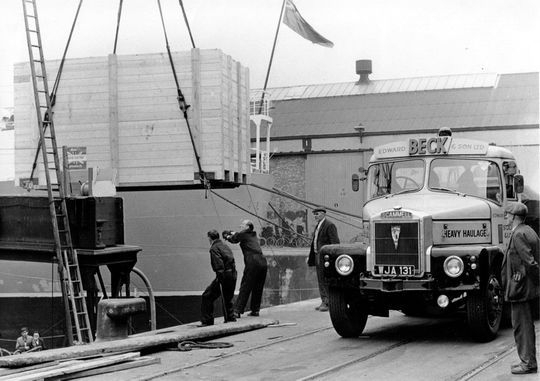 Job done as FG Foden 4x2 ballast tractor Reg No KDB 703, driven by Bill Corbishley, pulls away after unloading an English Electric 350 MW steam driven turbo-alternator destined for the Munmorah Power Station in New South Wales Australia. 6x4 FG Foden S18 Reg No HGB 631 arrives on the quayside at Liverpool Docks and awaits the unloading of equipment manufactured by the Oil Well Engineering Co Ltd.
FG Foden S18 Reg No KDB 703 arrives on the quayside at Liverpool Docks with another piece of equipment manufactured by O.W.E. destined for the Persian Gulf. S20 Foden ballast tractor Reg No ODB 832 is seen here maneuvering it's load into position in preparation for lifting onto the ship. 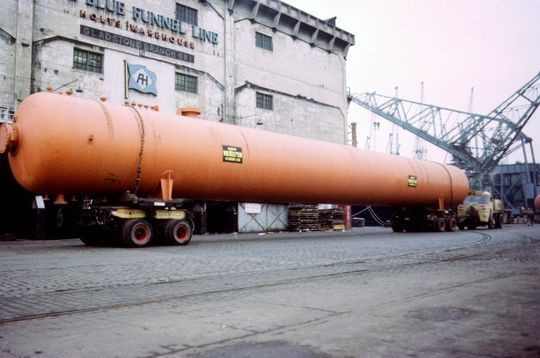 Manufactured by William Neill & Son Ltd of St Helens the large steel vessel was destined for export. It is pictured at Liverpool's Gladstone Dock Branch No 1. 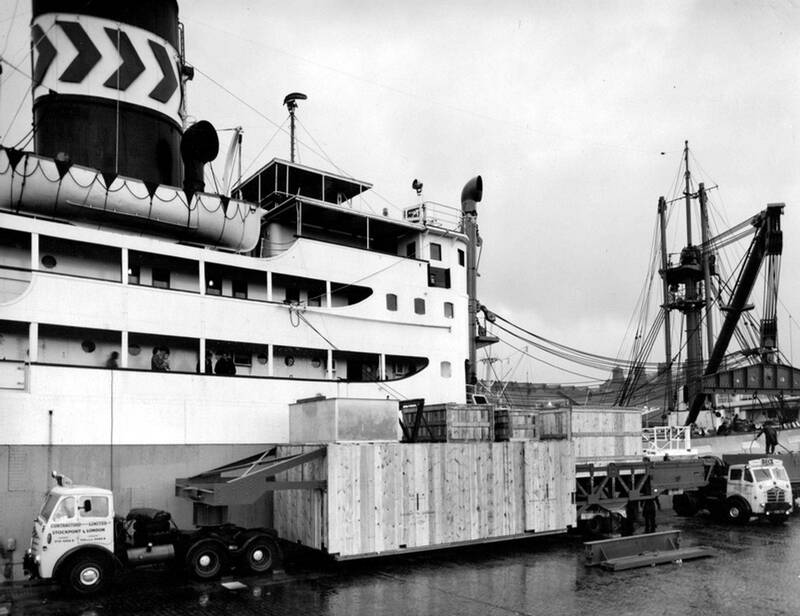 This was the berth of Alfred Holt's Blue Funnel Line ships and although it's official title was Holt's Warehouse it was commonly known as the China berth as Holt's ships served the far east.